In the academic calendar of National University all the curriculum have been fixed for Honours, Degree and Masters students for 2015, 2016, 2017 and 2018. 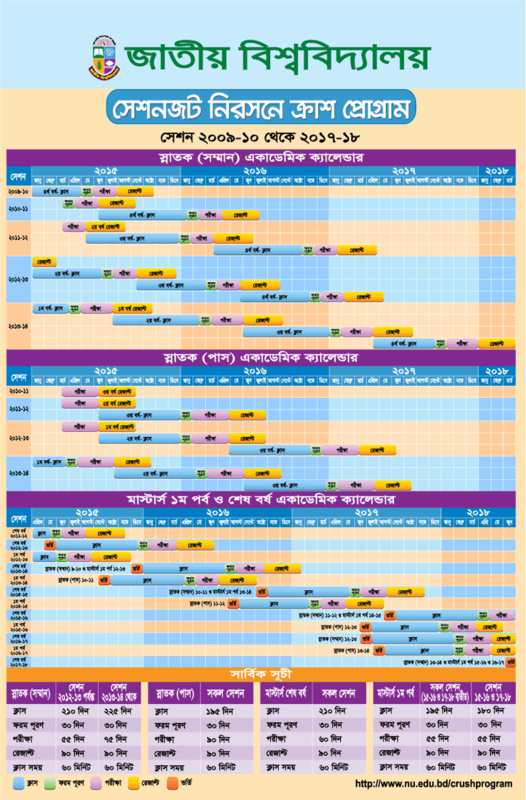 If this academic schedule is strictly maintained then it can expected that the National University Students would not go through session tangle in near future. National University is the biggest university of Bangladesh and‪ 5th largest university in the world according to enrolment. It was established in 1992 by an Act of Parliament of Bangladesh as an affiliating University. the National University is providing education at graduate and post-graduate level in colleges/professional institutions. Currently More than two million students are studying in 2154 colleges/institutions affiliated to this university. Like Our Facebook Fanpage facebook.com/resultnotice to get the latest updates of National University Academic Calendar and get future updates. This entry was posted in Degree, Honours, Masters, National university, Routine and tagged http://nu.edu.bd/crushprogram/, National University, National University Academic Calendar, National University Crush Program, National University Degree Academic Calendar, National University Honours Academic Calendar, National University Masters Academic Calendar, NU National University Academic Schedule, www.nu.edu.bd by Result Gov BD. Bookmark the permalink. Admin plZ…janaben…15-16 season.. R .exm a 1subj a fail korle ki. Pobary .. 1st year a thakty hbe ..na ki ..2ndyr a promoted HBe?